The US will be "unwavering" in its support for Nato, vice-president Mike Pence told European leaders at the Munich Security Conference. In the first major foreign policy address for the Trump administration, Mr Pence said the US would “stand with Europe today and every day”. But he told the gathered leaders that European countries were “failing to pay their fair share” on defense. That failure “erodes the foundation of our alliance”, he said. The vice-president pointed out that apart from the US, only four Nato countries had met a 2014 commitment to spend 2% of GDP on defense. “The time has come to do more,” he said. President Donald Trump warned before taking office that the US might not uphold its commitment to come to the defense of Nato allies who were not perceived to have contributed enough financially. Watching the speech was German Chancellor Angela Merkel, who spoke before Mr Pence. Germany is among the nations yet to meet the 2% target. Nato estimates for 2016 show that only the US, UK, Greece, Poland and Estonia do so. Mr Pence went on to say that the US would “continue to hold Russia accountable, even as we search for new common ground, which as you know, President Trump believes can be found”. Mr Pence said Russia must honor a 2015 peace deal agreed upon in Minsk, Belarus, aimed at ending violence in eastern Ukraine. His comments came amid huge controversy in the US over ties between the Trump administration and Russia, and concern in Europe over whether the new administration would attempt to restrain Russian leader Vladimir Putin. Russian Foreign Minister Sergei Lavrov, speaking at the conference, rejected accusations that Russia was responsible for destabilizing peace and described Nato as stuck in “Cold War” thinking. Mr Lavrov also denied allegations that Russia had meddled in the US election, saying he “saw no facts” pointing to hacking by Russian operatives. 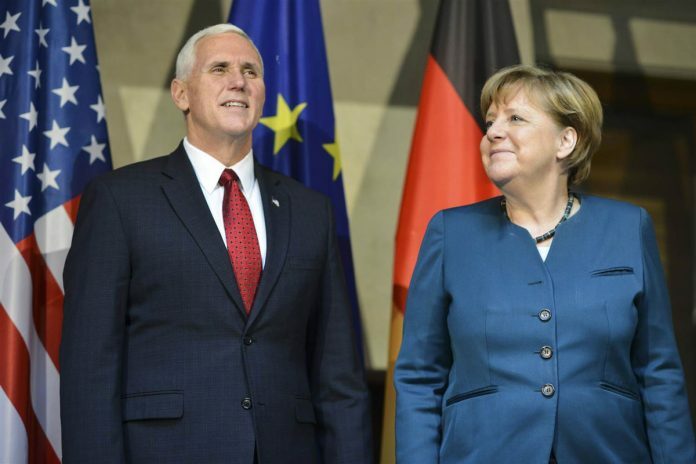 Speaking before Mr Pence, Ms Merkel called for increased co-operation between the US and the European Union on issues including Russian aggression and Islamist terror. The two leaders were scheduled to meet face to face later in the day. Speaking before Mr Pence, Angela Merkel, the German chancellor, said the question now facing the trans-Atlantic community was whether “we will be able to act in concert or fall back into parochial politics” – a subtle but clear dig at Mr Trump’s mantra of “America First”. Asked directly what she thought about the Trump administration’s rhetorical onslaught against sections of the media, Ms Merkel insisted that freedom of the press was a pillar of democracy. When Mr Pence took to the stage he stressed that he was bringing a message of reassurance from the new president, who would “unwaveringly” back America’s Nato allies. But he also used the opportunity to repeat Mr Trump’s long-held view that Washington’s European allies must spend more on their own defense. The Florida Daily Post is Florida's digital newspaper with the latest breaking, local, national and world news; entertainment, music, fashion, arts, travel, food, sports, political analysis, and commentaries of what's happening in our world today.